This is a shout out to all students who are interested in political art. 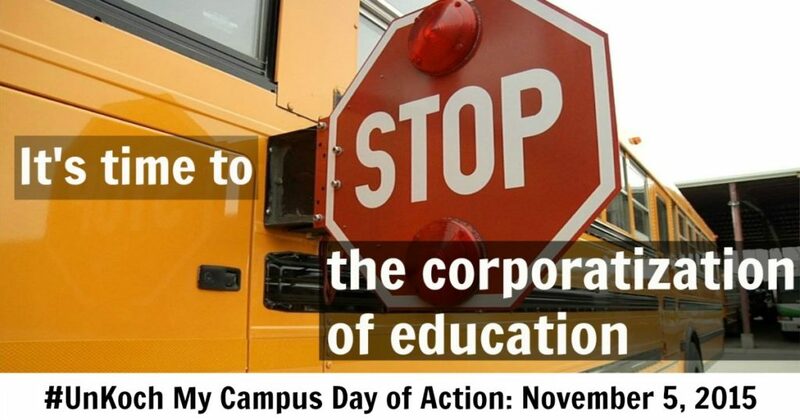 National Day of Action is just around the corner taking place this November 5th, 2015. In an effort to rally up students concerned with the corporatization of education and student debt, Progress Coalition is teaming up with campuses across the nation to work towards changing the policies on our campuses in order to protect our Academic Freedom. Does anyone remember the controversy when John Thrasher was voted in as president? He is the puppet man for the thoroughly plotted out plan on churning in corporate influence into higher education. The major corporate donors are Koch Industries who include two brothers making up the richest billionaires in the entire country. They have an unbelievable influence in politics ranging from the oil industry, agriculture, media, and political think tanks in efforts to lower costs for their own benefits in exchange for the well being of the environment, worker’s rights, and the American middle class. Progress Coalition needs your artistic help. If you are interested or know of anyone who would be interested in joining forces, please give me a call at 813-407-2650 or email me at cao13e@my.fsu.edu.